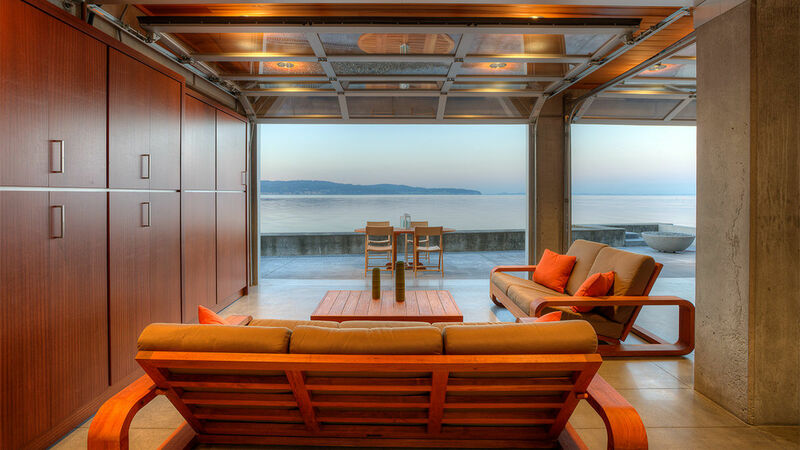 Dan Nelson’s “Tsunami House” is designed to resist the ultimate force of nature. 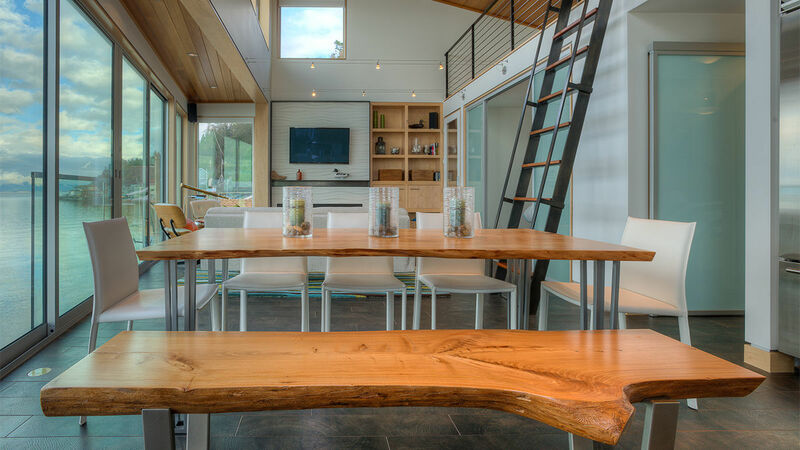 Dan Nelson, principal of Designs Northwest Architects, is regularly hired to design and build houses ready to withstand major weather events. Much of that has to do with his firm’s location in Washington State, where seismic risk runs high. He is expert at designing homes in preparation for wildfire and earthquake scenarios. 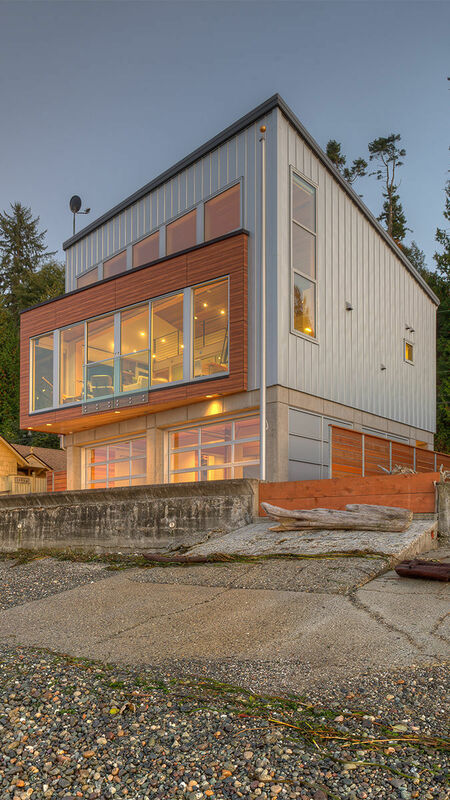 His “Tsunami House” is named for the 300-mph lateral waves it could face in the future. 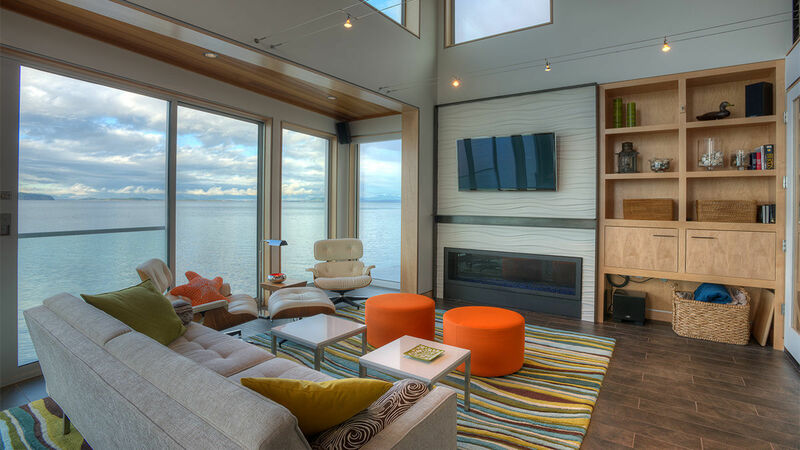 The project replaced an aging fishing cottage on Camano Island in Puget Sound. Because the soils are sandy and prone to liquefaction, Dan designed a concrete floating slab for the lower half of the framing structure. Code mandates all new construction in a high-velocity wind and flood zone be built on piers, so the house sits on 9-ft. concrete columns, which are tied into the slab with a “significant amount of rebar.” The connections for the panel wall system—located below the flood elevation—were designed to resist waterfront wind loads, but they are meant to be weak enough to fail under hydraulic loads during a high water event, enabling water to flow through the lower level. A steel moment frame is tied into the concrete frame, creating a hybrid structural system for lateral seismic design. In the event of an earthquake, the entire structure will move as one unit. 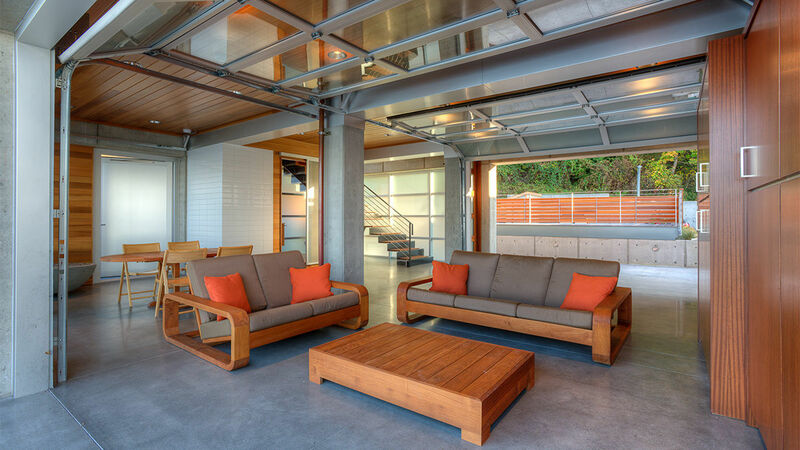 The height of the piers allows for additional living space; the lower level functions as an open-air cabana, while the main living spaces sit above the flood plane. 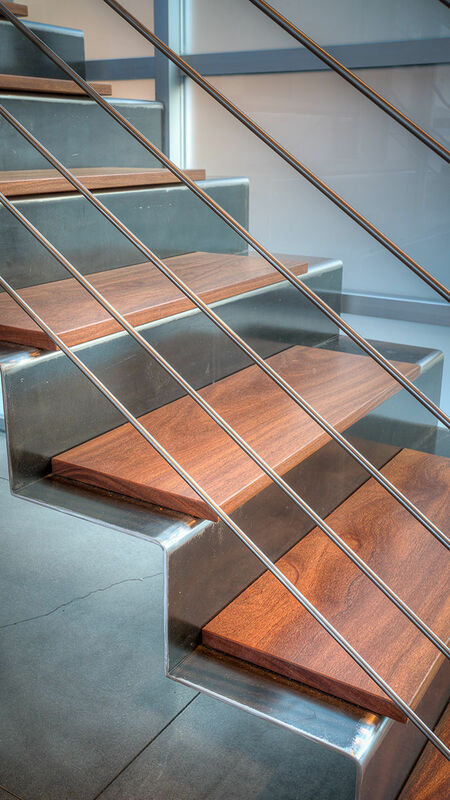 The so-called “Flood Room” features water-resistant materials, including buffed concrete floors with hydronic radiant heat, tiled walls, and a burnished or “blackened” mill-finish steel staircase. Of the house’s modern style, Dan says: “We are working more and more with low-maintenance materials that perform better under severe conditions, and those materials naturally lend themselves to modern design.” He also notes a shift that occurred about 6 years ago, when clients started moving away from the classic Northwest Craftsman style and toward modern forms and materials. 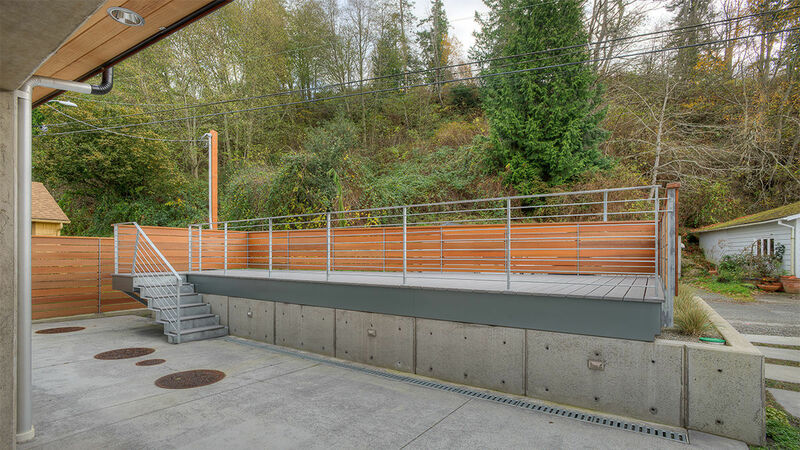 He regularly specs standing-seam metal cladding, Hardie fiber-cement siding, VIVIX Lap siding, phenolic panels, and Trespa panels, which he describes as akin to pressed-resin sheets. Dan notes, too, that modern design is often thought to be cold and sterile, which doesn’t resonate with the idea of home. For this project, his response was to warm the upper-floor interiors with natural wood-grain porcelain tile flooring and clear western red cedar on the ceilings and walls—a nod to the former cottage’s cedar paneling, which could not be salvaged. 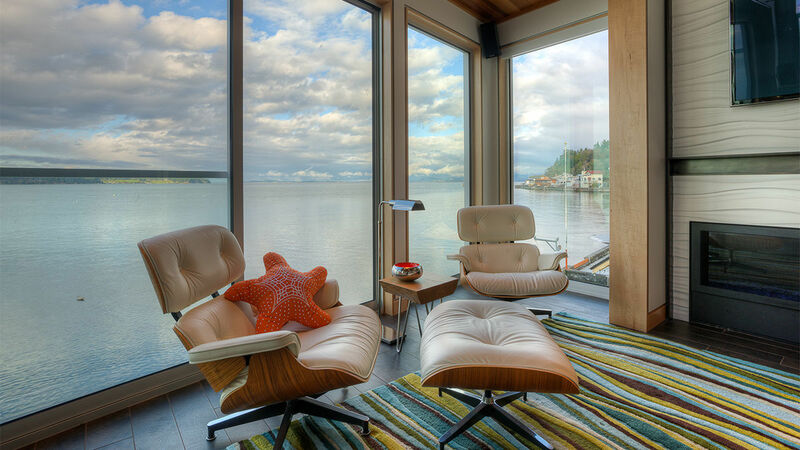 Having lots of glass to maximize views is one of the challenges when designing a vulnerable waterfront property. 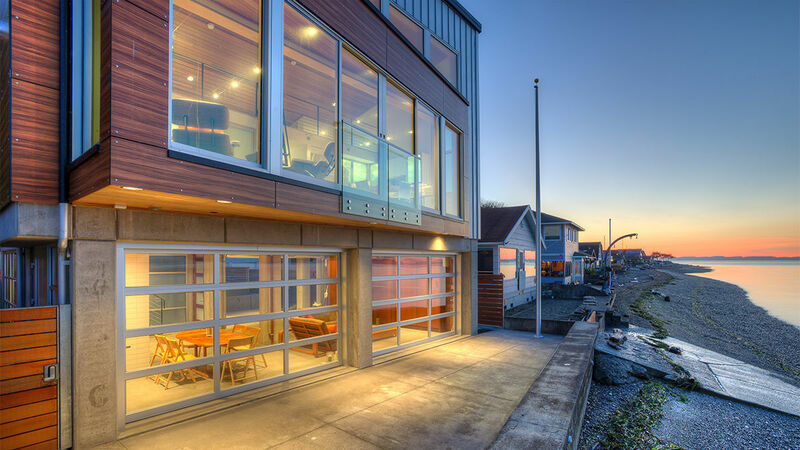 For the Tsunami House, Dan used Fleetwood fiberglass aluminum-clad windows with thermal break and insulated glass, which are extremely durable and comply with Washington State’s stringent energy code. The house sits on a small lot just 12 ft. from the bulkhead. On the south-facing side, a terraced courtyard separates the house from the road, and a deck disguises the septic system. The concrete frame for the fan-filter system protrudes 3 ft. above grade and runs nearly the entire length of the house. Had it been left as is, it would have been a terrible eyesore. “We try to take advantage of every opportunity,” says Dan of the problem-solution scenario. The sunny deck and courtyard work well with the cool covered cabana, giving the homeowners and their guests a few outdoor seating options.